A white circle 10 metres in diameter greets us on entering the flexible performance space in Loft 29. I stand next to B-boy Erak Mith of Tiny Toones (Phnom Penh, Cambodia). He is locked in eye contact with Aaron Lim of D-City Rockers (Darwin, Australia) directly across the circle and I recognise the calm, unflinching stare shared between the two. What becomes clear quickly in the early stages is that this is neither simply a battle nor a cypher exchange. This is a confrontation turned conversation – an extended conversation – between two B-boys in the ritual spaces of the breakdance (a.k.a. breaking) battle and cypher. In Between Tiny Cities, choreographer Nick Power manages to incorporate the ritualistic progressions of encounters between breakers to script a dialogue known to B-boys and B-girls: how the wary and intense games of one-upmanship eventually lead to deep mutual respect and recognition between them. Together with lighting designer Bosco Shaw’s composed wash, the opening piano keys of Jack Prest’s sound design empties the beginning standoff of any associations of hip-hop and street culture. This has the effect of introducing the focus of attention on the affinities and differences between the dancers’ vocabularies. 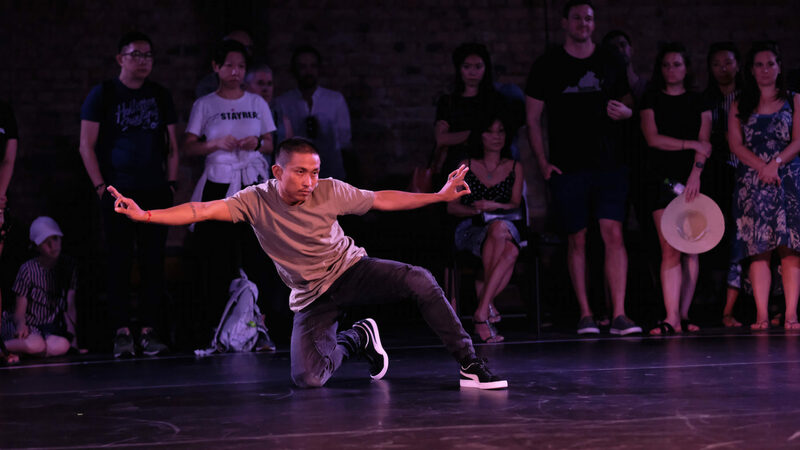 Their contrasting styles quickly reveal themselves in their manner of provocation: Mith mixes his Khmer dance lineages of the peacock and monkey dance and takes on a more footloose fashion, to which Lim responds with more calculated shield-shaped threading movements. These fitful, terse phrases rehearse the posturings familiar to B-boys and B-girls when they first meet: of sizing each other up, jostling for leverage in skill and style while not giving away too much of one’s movement arsenal. In the festival promotional material, I am urged by a quotation from Richard Watt of Arts Hub to observe how the performance “gently subverts preconceptions around hip-hop and masculinity”. For all the aggressive posturing, this ritual jockeying for primacy develops not just in their sparring (an unspoken rule in breaking dictates you never touch or hit an opponent in battle though your moves may connote violence) but most pointedly in the extended silences Power confidently invests in the performance. What caught my attention particularly was how Power’s choreography stayed alert to the possible distractions of playing up a homoeroticism in the intimate and playful exchanges that arose from these silences. When Mith and Lim wag their bodies, the echoes of uprocking jerk movements colour the competitiveness with humour, drawing audible laughter from the audience. During an intermission sequence, also largely in silence, Mith begins to tease a resting Lim with lines from a Cambodian nursery rhyme, and increasing physical contact. Yet even as they express amusement, their facial expressions and gestures retain a gentleness without straining to avoid intimacy. Thumbs go up, fingers wag, eyebrows raise: signals of respect are offered. Evidently the shared experience in the movement and cypher conversation allows them to freely express a homosocial desire for recognition, respect and community without tending to aggression and hierarchical competition. Early on, Mith and Lim exchange freeze combinations and arm threads across the cypher circle in near simultaneity. This conceptual sequence later finds resonance in a series of two-person tutting sequences, where their arms and bodies thread together to form geometries of solidarity, punctuated by assisted air baby and air chair freeze positions. When the first breakbeat drops, a third into the show, it triggers a light-hearted top-rock exchange between the two. By the time Prest introduces funk and soul elements to the beat, they have already affirmed each other’s movements and energised the space in their alliance. Similarly when Mith plays at being DJ as he sings, Lim responds on the fly to Mith’s pacing with precision, much to everyone’s appreciation. While Power’s use of the marked white circle signals his homage and adaptation to both the staged and organic conventions of the cypher and battle, I felt the intense focus between Mith and Lim tended to keep the audience close but always at arm’s length from their prolonged conversation. As spectators we were offered a charged intimacy with the performers, but I sensed the performance space being an essentially guarded one. When Mith and Lim briefly skirt the circle’s perimeter, the sharing of their liveness is direct but fleeting, as they quickly return to their games. Finding myself and fellow viewers semi-lit on occasion by Shaw’s washes and strobes made me conscious we were kept on the fringe. Perhaps this was borne out of preserving the sense of witnessing B-boys engage in their sacred space, retaining a reverence which audience congregations in B-boy showcases experience. In this respect, Between Tiny Cities delicately toes the line between including and excluding the audience, announcing itself as more of an enrapturing and entrancing spectacle. It builds upon Power’s previous work Cypher where he explored “hip hop’s most important ritual, a circle where style, rivalry and community exist and evolve”, involving more deliberate audience interaction there. Before speaking with the two performers and Power separately after the show, I’d been searching the full house for signs of other breakers present like myself. We lamented on the noticeable absence of local B-boys, B-girls and hip-hop dancers attending the show’s run. If there were any present, they were few and may have slipped out without staying around. Lim speculates that the selected visuals in marketing collaterals may have signalled a much more contemporary dance impression than one of street dance and hip-hop. Another slight hindrance during the performance may have been the flooring of the venue. The black vinyl mats were sufficient but not the most ideal surface, with a tiny section flapping off mid-performance, and the extra friction seemed to force the dancers to adjust some of their sliding-based movements. Mith confirmed this in conversation, noting that polished wood floors would ease the gliding of his headslides and knee tracks. In the ending sequence, Mith and Lim converse through some of their most technically demanding manoeuvres with combinations of power moves and freezes. As Shaw’s lighting dims and Prest’s low tones chime on, the B-boys continue even in darkness: the sound of shoes and bodies perform a steady meditation in movement. 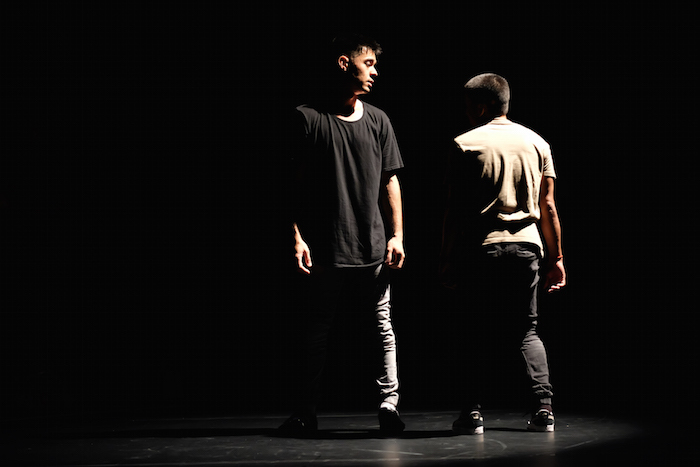 It brings home the tender flipside that underscores the aggressive masculinity that fronts hip-hop: throughout the piece we have seen how Mith and Lim express knowing looks of recognition and respect for what they have drawn out of each other in dialogue. Now the final silence confronts us with the prospect of such conversations extending ad infinitum. Between Tiny Cities ran at the George Town Festival 2018 from 04 – 05 August 2018 at Loft 29, Penang, Malaysia. This review is based on the performance on 05 August 2018. Guest Contributor Nah Dominic is a dramaturg, b-boy, writer and performance maker. He recently performed dead was the body till i taught it how to move with Bhumi Collective in July 2018. Presently, he is dramaturging on projects with The Second Breakfast Company and RAW Moves, Editor-in-Chief at Unseen the Magazine and writing a blog-biography of local pioneering B-boy Syafiq Junior called the #sjr365 story. Across his endeavours, he enjoys the intersections between the critical, creative and collaborative. He graduated with a MA in World Literature from the University of Warwick.